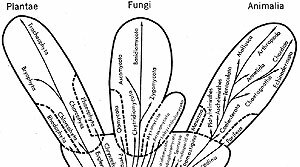 Behold the grand spectrum of life... the five kingdoms (or four or six, depending on which system of classification you use), the several dozen phyla, the hundreds of classes, all the way down to the millions and millions and millions of species. I got to thinking, how many of those species do I interact with on the basic predator/prey level. Put more simply, how many different species do I consume? For the entire month of March, I'm recording every species I eat. I'm only two days in, but I've already racked up several dozen species...animals like cow and chicken, plants like corn and rice (including a surprising number of trees. Just think of where things like maple syrup, apples, lemons, and walnuts come from). I've also picked up a few species of bacteria (thanks to some yogurt) and a couple of species of yeast (the result of some sourdough bread and a beer). Check back at the end of the month and I'll have the total count. Any predictions? > I'll have the total count. Any predictions? Yes. Most of them will taste "just like chicken".